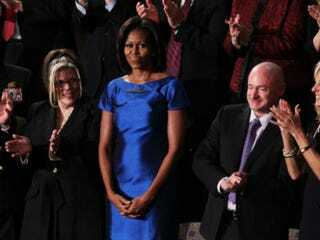 The designer behind Michelle's SOTU dress: The cap-sleeve twill dress that the first lady wore in the audience ot last night's State of the Union Address was from Barbara Tfank's Resort 2012 collection. Tfank is a Los Angeles-based costume designer-turned-fashion designer who is known for incorporating jewel tones, bright colors and ladylike prints into her 1950s silhouettes. Halle Berry's nanny — who Gabriel Aubry allegedly pushed into a door while she was holding his daughter, Nahla — was rejected by a judge who called the petition "insufficient and speculative." Pariah "Snubbed" by Oscars? The film got no nominations, while The Help cleaned up. Proof of "Hollywood's commitment to its tradition of honoring the same black images"? Ebony says yes. Egyptians take to streets to mark revolution anniversary: A year ago today, Egyptians started a revolt that led to the fall of President Hosni Mubarak. Marking the day, tens of thousands of people took to the streets both in celebration and in protest of the military rulers that took Mubarak's place, NPR reports.